Representative Honours: Northern Ireland: 21 Full Caps / 3 Goals (1968-1972), 1 Under-23 Cap (1967). Club Honours: (with Middlesbrough) Football League Division Three Runner-Up 1966/67 (promoted). Awards: (Teeside) Evening Gazette Player of the Year 1968/69. Regarded as ‘the natural successor to Jimmy McIlroy’ as Northern Ireland’s linkman, McMordie’s career had got off to a stuttering start. As a fifteen year-old he had travelled from Belfast to Manchester with a certain George Best for a two week trial with United. Homesick, the pair returned to Belfast after one day. Best of course returned to Old Trafford to become a legend, McMordie however stayed in Belfast, working as a plasterer and signing with Dundela. 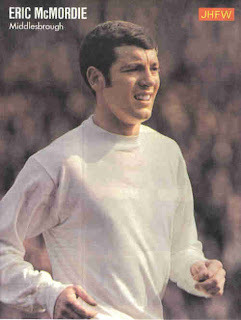 McMordie was later persuaded to return to England as an eighteen year-old, signing with Middlesbrough in 1964. 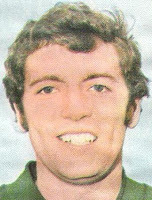 He made his debut at Plymouth in September 1965, scoring on his home debut in a 4-0 win over Rotherham two weeks later. That season he made a total of 17 League appearances, scoring four goals, but he couldn't help Boro avoid relegation to the Third Division for the first time in their history. Middlesbrough bounced straight back to the Second Division, finishing runners-up in 1967, though McMordie had to bide his time, only achieving a run of games in the season's run-in. Although the goal-touch had deserted him, he failed to find the net in any of his nineteen appearances, McMordie was awarded an Under-23 cap. The match against Wales at Windsor Park resulted in a 2-1 win, although the match was brought to an early halt due to the atrocious weather conditions (indeed, some sources record the match as ‘abandoned’). For much of his career McMordie was regarded as a skilful goal-maker more than a goal-taker, he did score three goals in his first five caps, including two beauties against England and Scotland. Alas they proved the only goals of his senior international career. He continued to good effect as a midfield ‘schemer’ and despite his relatively slight build was never afraid to get stuck into the fray. On their return to Division Two Middlesbrough immediately set about building towards another promotion. McMordie was often the star-performer as the team finished 6th, 4th, 4th, 7th, 9th and 4th, just missing out on the top-flight. Promotion was finally attained in 1974, but by then McMordie had been sidelined. McMordie had sought to leave Ayresome Park in 1972, but a deal with Blackburn couldn't be agreed. In 1973 the arrival of Jack Charlton as a manager unimpressed by flair put the final nails in McMordie's Middlesbrough career. He enjoyed a successful loan spell at Sheffield Wednesday in the autumn of 1974 scoring six goals from just nine games before his contract expired and he was allowed to leave Ayresome Park for York City in 1975. York were relegated to Division Three in McMordie’s first season, and mid-way through the next campaign he was transferred to Hartlepool United in Division Four. In 1978, just past his 32nd birthday McMordie decided to hang up his boots to pursue business interests on Teeside. Summary: 21/3. Won 8, Drew 6, Lost 7. That colour photo v Wales is actually David Craig of Newcastle fame. Thanks Ken. I can sort of see it!